Vanderbilt University researchers are planning to launch a major initiative to acquire “dense genotypes” over the next two years from DNA samples that have been stored in BioVU, Vanderbilt’s massive DNA databank. The samples will be analyzed using specially produced genotyping “chips” and high-throughput robotic instruments. Within minutes, the machines can produce a genotype, or read-out of up to 2 million common genetic variations from each sample. From the matching medical histories, researchers will be link genetic variations to disease risk and response to treatment. The ultimate goal is “precision medicine” — giving doctors the tools they need to quickly diagnose the genetic characteristics of the diseases that afflict their patients and which treatments will be the safest and most effective for each individual. “It’s an engine for discovery,” Nancy Cox, Ph.D., the Mary Phillips Edmonds Gray Professor of Genetics at Vanderbilt, said of the genotyping initiative she is leading. Cox, who directs the Division of Genetic Medicine and the newly established Vanderbilt Genetics Institute, was recruited last fall from the University of Chicago, where she built a national reputation for her contributions to genomic science. 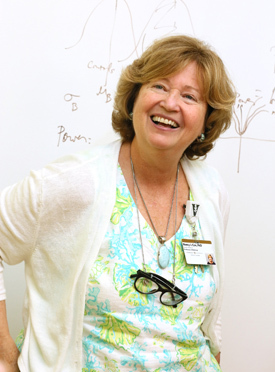 She said she came to Vanderbilt because of the unique scientific opportunities offered by BioVU and its DNA sequencing and genotyping cores, and by faculty members in the Department of Biomedical Informatics, who have pioneered innovative ways to calculate the impact of genetics on human health. “We’re really excited about this project, not only for the great science and the many ways this is going to help so many patients, but we’re also excited by the capacity it leaves behind,” agreed Simon Mallal, MBBS, the Major E.B. Stahlman Professor of Infectious Diseases and Immunology. 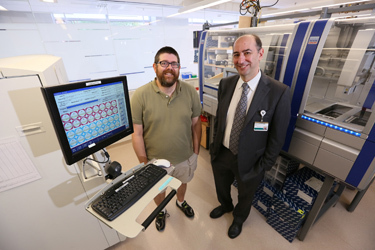 On Aug. 1, Mallal was named director of the genomics cores in the basement of Medical Center North where the BioVU is located and where the genotyping will take place. They’re collectively called VANTAGE — Vanderbilt Technologies for Advanced Genomics. Mallal, an internationally known HIV/AIDS researcher who was recruited from the Murdoch University in Perth, Australia, in 2013, succeeds James Crowe Jr., M.D., the Ann Scott Carell Professor and director of the Vanderbilt Vaccine Center, who had served as VANTAGE director since 2012. Under Crowe’s leadership, VANTAGE streamlined its operations, added advanced core technologies and implemented a successful cost recovery model, with the goal of ensuring long-term, sustainable access to cutting-edge genomics resources for all Vanderbilt researchers. “Dr. Crowe has been tremendously effective in helming VANTAGE over the last several years,” said Lawrence Marnett, Ph.D., associate vice chancellor for Research and senior associate dean for Biomedical Sciences. “Vanderbilt is profoundly thankful for his efforts to support and grow VANTAGE. His extraordinary leadership and focus on serving the research community has prepared the core to play a major role in the BioVU genotyping initiative,” Marnett said. Among his contributions, Crowe recruited Thomas Stricker, M.D., Ph.D., as associate director of VANTAGE. Stricker’s role is to enable effective oversight of the distinct research service lines provided by the shared resource and keep pace with the fast-changing genomics field by making new techniques and methods available to investigators. Crowe also has worked closely with stakeholders in the Department of Pathology, Microbiology and Immunology to create and recruit a new position dedicated to microbiome informatics research and development. This position will expand the scope of VANTAGE’s expertise capabilities in support of basic science research. Cox said the initiative’s real strength is BioVU, which began storing genetic material extracted from discarded blood specimens from Vanderbilt patients in 2007. The DNA samples are matched with electronic health records that have been scrubbed of information that could identify individual patients. Cox praised Vanderbilt and key supporters of BioVU, including Dan Roden, M.D., assistant vice chancellor for Personalized Medicine and the William Stokes Professor of Experimental Therapeutics, for advocating for a long-term investment in genomic science. That’s hard to do at universities, when leadership and institutional priorities change. But because of Vanderbilt’s persistence, “we’re poised now to be able to reap the benefits of all these past investments … in ways we can’t even imagine yet,” she said.